Grand Post Office building in Istanbul celebrating the 174th anniversary of foundation. Ptt, an abbreviation for Posta ve Telgraf Teşkilatı, is the national post and telegraph directorate of Turkey. Formerly, the organization was named Posta Telgraf Telefon. After the privatization of the telephone telecommunications service business, the directorate was renamed, keeping its acronym. It is headquartered in Ankara, and is known as TURKISH POST internationally. On October 23, 1840, the Ottoman Ministry of Posts was established. In 1855, the first telegraph service and in 1909 the first telephone service were put into use. In the same year the name of the ministry was changed to Posta Telgraf Telefon ("Posts, Telegraph and Telephone" or PTT for short) a name which was used for 86 years. After the Turkish Republic replaced the Ottoman Empire in 1923, the ministry became a general directorate of the Republic. In 1995 the telephone and other telecommunication services were transferred to newly founded Turk Telecom (which was soon privatized). Accordingly, the directorate was renamed as "Organization of Post and Telegraph" (Turkish: Posta Telgraf Teşkilatı). Thus the former acronym PTT is kept. 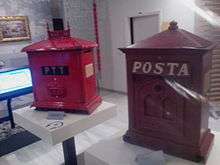 The total number of postal offices all over Turkey is about 5,000 as of 2011. Ptt runs for the ever-growing quality and efficiency with the fully modernized technology. It owns an ISO-9000 Quality Certificate. The international outbound mail leaves the country within max. 3 days from UPİM (Uluslararası Posta İşleme Merkezi – International Mail Processing Center at the Istanbul Ataturk Airport (main hub). The most of the mail bags are transported by the state-owned Turkish Airlines (actually 219 destinations). UPİM gives the information on the items sent like the Carrier name, Flight no. and Mail bag no. the item included when the detailed info needed domestically. EDI (Electronic Data Interchange) is provided whenever available. UPİM distributes inbound mail to the regional processing facilities in Istanbul within max. two days. They deliver the mail to the final destination in two days mostly. Ptt’s latest intelligent building with the mail processing systems from Japan (AVPİM & AVKİM – European-side Mail and Cargo Processing Center, Hadımköy/Istanbul) will be in service soon. 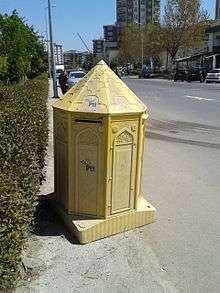 TURKISH POST (Ptt) from the Blog "Erkan's Post 2 Mail"
Wikimedia Commons has media related to PTT (Turkey).